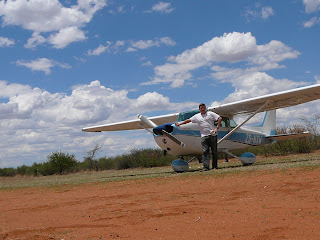 When I searched online for information on obtaining a landing permit and clearance for Namibia, I found this report about a few people flying through Namibia, Botswana and Zambia a year ago. So, I emailed them with questions. 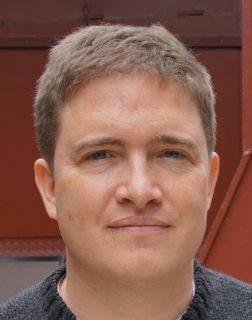 Turns out that most of them were German, one of them (Ecki) is living on a farm in Olifantwater, Namibia, some 100 nautical miles south-east of Windhoek, and another one, Ralph, was there on holiday just now with his rented plane (a Cessna 182). 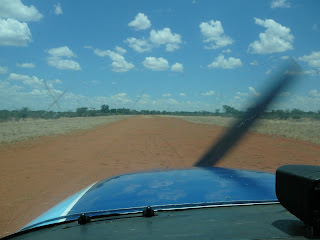 Ecki had only recently built a runway on this farm, and he invited me to come over. Just landed in Olifantwater - the third airplane ever to land on this strip. Unfortunately, since I was held up by a day due to the thunderstorms in FYKT (Keetmanshoop) a day before, nobody was here... 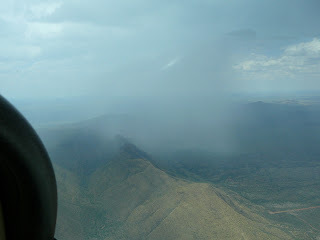 So, I took a picture and departed to Windhoek. Red dunes surrounding the farm. 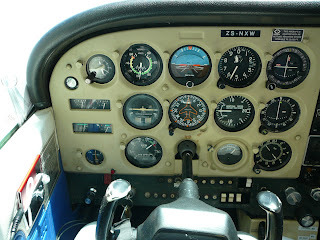 The panel of ZS-NXW. The most modern part definitely the iPod on the left for the pilot's entertainment on long legs. 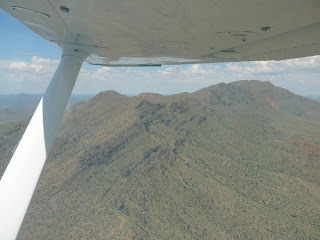 The ridge south of Windhoek, very close to the airport FYWE (Windhoek Eros). Eros serves mostly general aviation (that is, smaller planes); the international airport is some 45km east of town (and not surrounded by mountains). 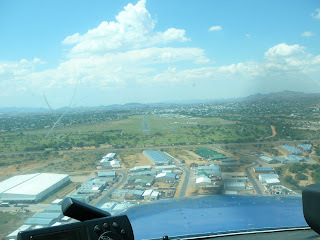 Final approach to FYWE (Windhoek Eros, Namibia) runway 01. Further North to Windhoek: FYKT-Olifantwater-FYWE was published on December 01, 2006 .